I was in Sri Lanka at the end of January 2003 for one of the last regional meetings for our report cycle. We stayed in the capital, Colombo, for the first couple of days, barely leaving the hotel and then left on a fieldtrip to the north of the island. We arrived in the ancient city of Anuradhapura at sunset and raced around the temples as the sun disappeared. It was dark by the time we got to the Sri Maha Bodhi, the ‘tree of enlightenment’, an offspring of the Buddha’s fig tree, brought there in the 3rd century B.C. The tree was barely visible in the temple surrounding it; its branches were held in place by crutches, like a geriatric. The next day we got up very early to continue the drive north. The landscape started to flatten out and become less densely populated. We stopped in Vavuniya to pick up our host, a UN official who briefed us on the bus and got us through the border checks necessary to enter the territory controlled by the Liberation Tigers of Tamil Eelam (LTTE). We took the only road through the LTTE-controlled areas, the A9, scene of fierce fighting during the conflict as the Sri Lankan Army attempted to push reunite the government -controlled areas. They made it to within 30 kilometers, before pulling back and as they fought, both sides laid antipersonnel mines in huge numbers. We yelled at our bus driver to stop overtaking as he kept sliding on to the verge of the road, which we believe had not yet been cleared of mines. Sri Lanka’s north and eastern regions are heavily mine-affected as a result of the conflict with the LTTE that started in 1983. The LTTE and the Sri Lankan government agreed to a ceasefire in February 2002, and since then neither side is believed to have resorted to new use of antipersonnel mines though neither side has subscribed to the ban treaty yet. The peace process is continuing… If it succeeds tourists will take over the country, especially its gorgeous beaches and beautiful temples. 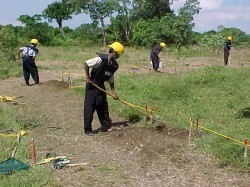 We reached Killinochi, a town in the LTTE-controlled zone by midday and visited a LTTE demining training site where we talked to the deminers and examined their techniques and equipment. Each deminer was equipped with a safety helmet and vest, but wore sandals or just bare feet. Their equipment comprised of basic gardening tools, the main one was a standard garden rake that they used to pull back the vegetation and a layer of dirt. Then they picked up a two-pronged hoe and used it to pull even more dirt away. We were shocked. No metal detectors or mine detection dogs. No prodders to probe the ground at a 45-degree angle for mines. It was a complete turn-around from what little mine clearance I have witnessed to date. A reporter with “Tamil Tiger Radio” asked me what the campaign was doing to convince the producers to stop manufacturing mines. I told him we now have 14 producing countries, down from 55 just five years ago. We lobby these governments, as in nearly every instance the manufacturing is done by state-owned entities. I asked the reporter to find out what the LTTE was doing to halt its own production of the infamous “Jhonny” wooden box mine and more sophisticated plastic mines. We had time to stop in at a prosthetic limb-manufacturing center, which was adorned with murals depicting mine awareness messages, before we got back on the bus to start the long ride back to Colombo. I cursed that we had scheduled so little time. In Colombo the next day, I took some time out before our final press conference and had lunch at the Gallery Cafe in the beautiful former home of renowned Sri Lankan architect Geoffrey Bawa. We checked out Fort, the commercial capital of Colombo, and had dinner at the Galle Face hotel, a sprawling colonial-era hotel on the beach, perfect for drinks at sunset. As I left the next day I read in the paper that armed robbers had stolen millions of rupees in a Fort bank while we were in the area. They had apparently made it through several army checkpoints as soldiers protecting the nearby parliament presumed the armed men were security for some politician. NSP Research – Updates is powered by	WordPress 2.9.2 and delivered to you in 0.096 seconds using 16 queries.